family(?) inside a pearl circle: shield bearing a double cross with anchor ended arms. As for the Cyrillic legend see the picture below. The pictures of the first coin are taken from E-bay, with the kind permission of the owner. The second Moldavian old coin belongs to the collection of Mr. Bogdan Costin, through the kind permission of whom the pictures are present on Romanian coins. Bogdan III, also known as Bogdan the Blind because of his losing one eye in a battle, son of Stephen the Great and the Holy, ruled over Moldavia between 1504 and 1517. 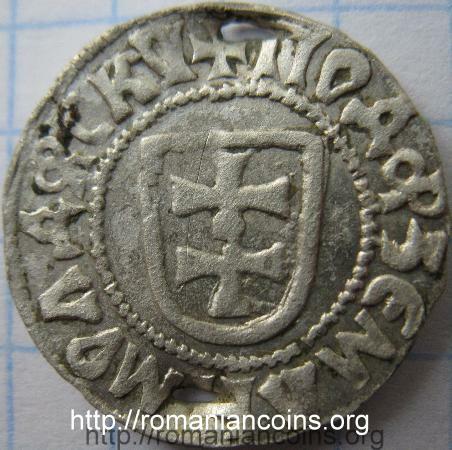 Bogdan struck Slavonic legend coins only (i.e. using Cyrillic letters). 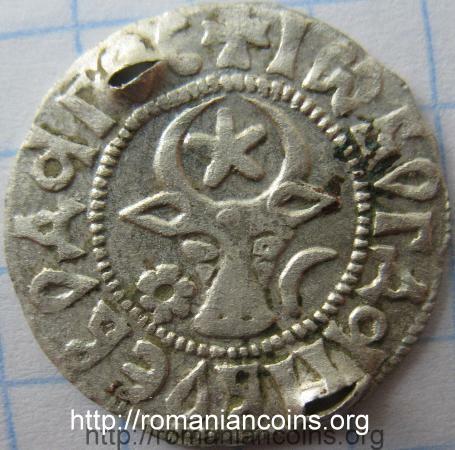 Latin had been up to him the only language to be used on Moldavian coins with the mere exception of some coins known from Alexăndrel (that used both official languages). This piece is classified by Monede şi bancnote româneşti (the Bible of Romanian numismatics), as being a type I gros of Bogdan III. 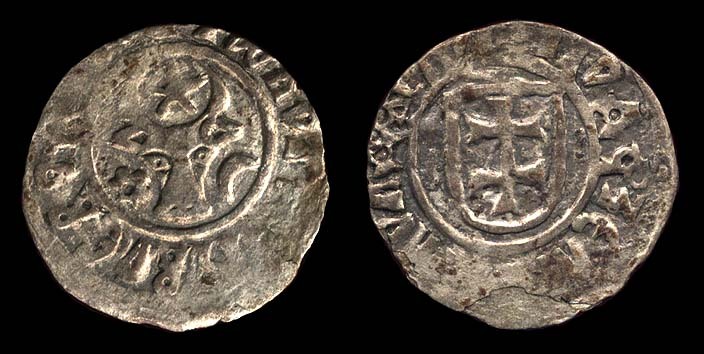 This particular coin has not been weighed, but we know for a fact that the weight of this type of money ranged between 0.9 and 1.05 grams, being though sometimes deemed as double gros. On the lower part of the reverse of the second coin on tis page a certain exfoliation of the better title silver coat with which a lower title core was covered can be observed. That was a technique not so seldom used in Moldavia of the time. It is known also on coins of Peter Muşat and Stephen II (remark of Mr. Bogdan Costin).